I might be making some poor decisions in an effort to not seem like an ‘ugly American.’ It’s just really difficult to decide what is an accepted cultural norm and what is just plain-out-of-line. 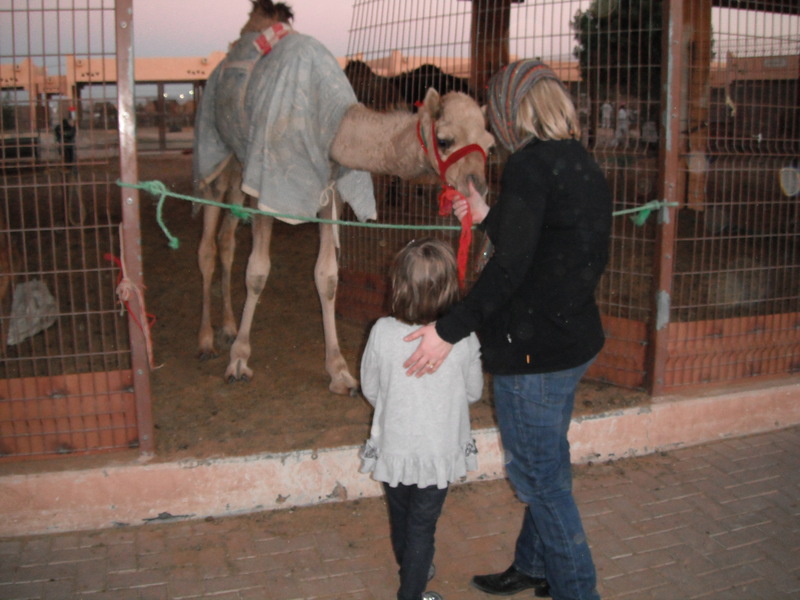 Like when my family and I went to the camel market in Al Ain. Maybe I shouldn’t have just giggled uncomfortably when a fifty year old Pakistani man tried to kiss my six year old daughter on the mouth. Hmmm. I better start off by describing the camel yard. All the guidebooks claimed it was the last of its kind and something we should not miss. So, after two days of Al Ain’s forts, mountain passes, and an amusement park (Hilli Fun City, oldest amusement park in the Gulf! Ride a roller coaster that’s almost as old as the UAE! Yeah!! ), we drove through warehouse area after dodgy warehouse area at sunset, with KC determined to find this fabled tourist site. We smelled it before we found it. Pen after pen with lots of camels inside, exactly as you’d expect, if you are actually expecting to find something as odd as a camel market. We parked our shiny white Volvo SUV behind a closed up feed store and we stuffed our youngest into a backpack contraption that KC swung over his shoulders. There was not one other non-camel herd person there until a car full of German-looking people passed by slowly (fair haired with square, wire rimmed glasses, definitely European). “Oh, phew, we’re not the only tourists,” I said to my husband. I wanted to wave at them, Look at us! We read our guide book too! They stopped in the road just ahead. 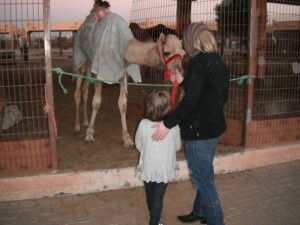 The women in the passenger seat glanced at us, at the camels, then back at us. She said something low to the driver and they did a U-turn and drove away. Quickly. That’s when KC suggested I take the scarf off my neck and wrap it around my head. That’s when I should have decided to get back in the car and demand my husband take us back to our nice hotel. Instead I covered up my blondish locks and held tight to my kiddo’s hand. I’ve found that, here in the Middle East, holding on to a child always helps ease potentially uncomfortable situations, giving me the appearance of virtuous mother rather than wanton great devil whore of USA (yes, I have an overactive imagination). We were immediately accosted by a man telling us that he had every camel conceivable, big camel, white camel, baby camel. KC began chatting with the gentleman, who said he was from the border of Pakistan and Afghanistan, as he led us deeper and deeper into the pens, farther and farther from our first world Volvo. 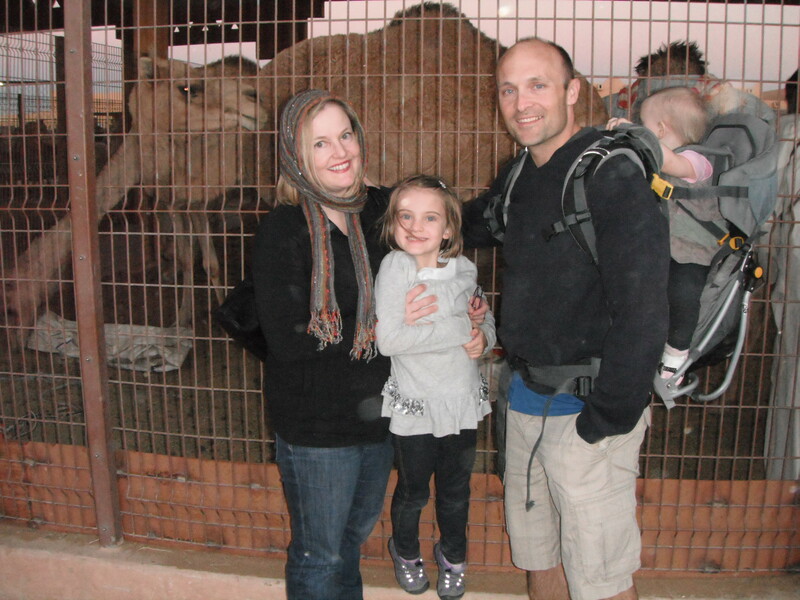 He offered to take photos of us with his camels, and we said yes. Every few steps, a young man would peel off from some dark corner and start following us. They were all wearing long knee-length shirts and loose pants in tones of brown, some with black and white checked scarves tied around their necks. KC greeted each; all of them seemed to be from the very place in Afghanistan where he and his infantry company had been searching for Osama Bin Laden in 2004. I couldn’t believe that he was telling these guys that yes, he knew Paktika, why, he had spent a year of his life there! Imagine that! In my mind, my husband looks every bit the Army officer he is. I also didn’t hear him say that he’d been a part of an “NGO” rather than a trigger-finger part of drone-dropping America. So when they started asking for money, I wanted to toss them a wallet and run, assuming there’d be an AK behind that grizzled so-called baby camel. Not KC. By now we had accumulated about ten men and could no longer see the road. All of them asking for cash. KC gave the guy who took the pictures the 25 AED he had set aside for that very purpose, less than eight dollars, and then amiably shook hands with the others. Not happy with the amount, the man kneeled in front of us, grinned, and tried to plant one my eldest daughter. Who, playing it much better than her mother, smoothly ducked out of the way of the offending mustache and made a face that clearly said kissing was just plain gross. High fives seem to be the intimacy substitute of choice. Whenever a stranger gets too close– cheek pinching, bear hugging, random tickling, hair mussing (and then there was that time in Jordan when a guy picked Maeve out of KC’s arms and started throwing her up in the air as she screamed)– I have instructed my daughter to offer a high five. This time I understood we were outnumbered, realizing that whatever Ranger School moves KC remembered, he would not be his fighting-best with a baby strapped to his back, but thank God I was wearing cowboy boots and I was fairly certain I could gouge some eyes if need be (my Irish father didn’t show me how to beat the hell out of that punching bag in the basement for nothing). Meanwhile Maeve coolly lifted a hand and slapped a sound high five on the man’s palm. “Ok!” he shouted and stood. KC looked at me. I grabbed Maeve’s hand and started walking with husband bringing up the rear. That was it. No one followed us. The sun kept setting. 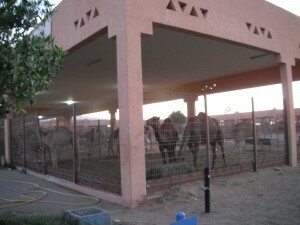 The camels kept making the strange noises camels make. I didn’t take the scarf off my hair until I was inside our car and the camel market was in the rear view window. Then we gave our six year old a long talk. High fives good. Kissing bad. And no kissing on the lips until she gets married.